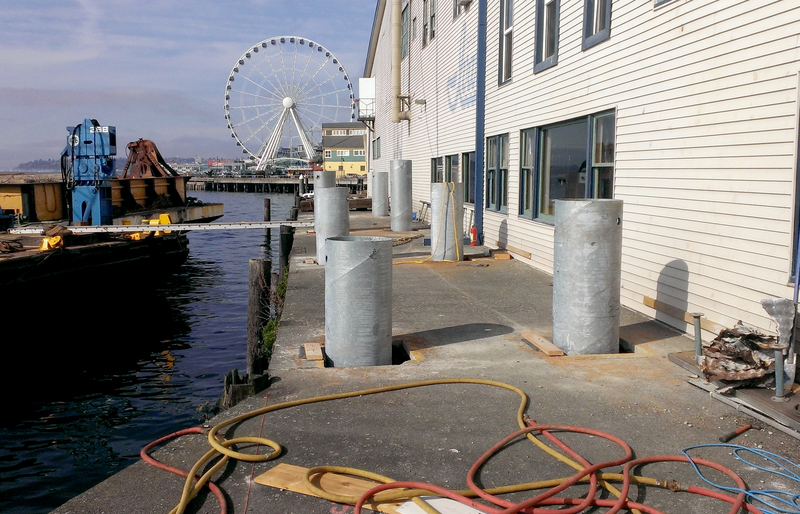 A GeoEngineers project, Ivar’s Pier 54 Seismic Upgrades and Renovation in Seattle, Washington, has been recognized with two additional awards. The Seattle Section of the American Society of Civil Engineers (ASCE) gave the project an Honor Award in the structural category as a Local Outstanding Civil Engineering Project, and project construction lead W.G. Clark Construction earned a Construction Grand Award from Associated General Contractors (AGC). It’s the latest in a string of recognition for the project, which renovated historic Pier 54 and Ivar’s, a waterfront restaurant on the pier. Concerns about the stability of the 100-year-old wooden pier, especially in the event of an earthquake, motivated Ivar’s to begin a series of significant seismic upgrades to the structure. As a member of the Reid Middleton team, GeoEngineers performed a seismic hazard analysis as a first step toward developing geotechnical recommendations for the pier using performance-based design approach. “The key to this project was understanding not only the interactions between the piles and pier/building structures but also the interactions between the pier and the adjacent seawall, which required in-depth and detailed numerical modeling analysis,” said Principal Geotechnical Engineer King Chin. The team understood that the new seawall, built just feet away from Ivar’s, would affect how the pier would behave in earthquake conditions. By taking a broader look and including both structures as a single system in their analysis, they were able to reliably design the seismic upgrade to meet the desired performance objectives under earthquake conditions. Reid Middleton based their renovation designs on GeoEngineers’ modeling results and recommendations. They used the modeling results to optimize new steel piles by incorporating existing timber piles. This meant fewer piles, and made it easier to install them in the limited space beneath the restaurant structure. The team also replaced existing timber aprons with new steel pilings, precast concrete caps and deck panels. Ultimately, by showing that it was possible to use fewer piles and still maintain high safety standards, GeoEngineers helped lower overall construction cost.